There are few people who have capacity to do extra-ordinary things wheatear they are professionally trained or not but they have different ideas and dreams to make them in reality. Waheed Babar is one of those people. 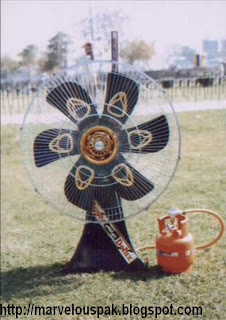 Waheed, resident of Lahore, Pakistan, invented a “Gas fan” which is powered by usual domestic gas and LPG. This invention is simple yet powerful according to current needs of Pakistan and other parts of world where electricity is still rare resource. According to its creator, the fan can run on both LPG and natural gas, running up to 400 hours on one kilo of fuel. This fan as for domestic gas costs just Rs. 1 for 4 Hours and as for LPG it costs Rs.1 for 2 Hours. He has specially written "MADE IN PAKISTAN” on it so people don't get confused that it is made in Pakistan or Made in China. So this makes him the first and only inventor of Gas Fan in the whole world. He has been working on this fan for about 25 years and at last he got succeeded in it. "If at first you don't succeed try, try and try again." 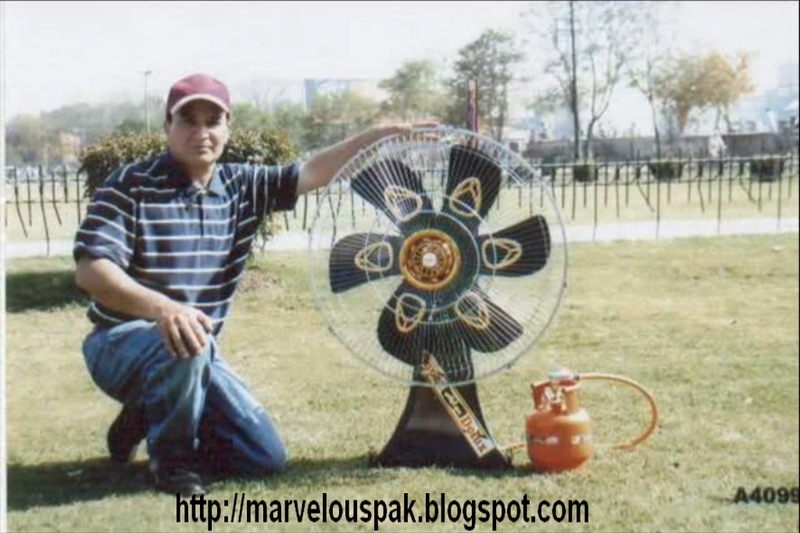 Before this his father made a fan somewhat like it but at that time it required kerosene oil to work and now he made a gas fan because of inflation and so that everyone can afford it easily. Babar, who has had no formal education, claims he is now working on a gas-fired air conditioner. However, due to shortage of funds he is unable to make it in bulk. Because of which, there’s no current distribution or sale for this product but hoping for it’s soon arrival in Market. Showing fan to attract investors for Gas powered AC. Lol. Good scam.